Usually if someone has asked a question or does a web search, they have a specific need in mind. The bulk of what I make are quilts ranging in size from 12” x 12” up to a King size of 100” x 120”. When I ask what batting should I use I not looking for a discourse in batting or a run-thru on the thermal-dynamics of polyester vs. cotton vs. cotton/poly blend. 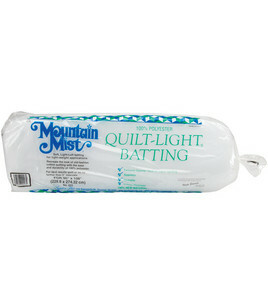 I’m asking about a personal preference, what would you use if this was a quilt you were making for a family member and why would you select that particular batting. I have noticed that there is far fluffier (read “more loft”) batting out there, but MY personal preference is warm and natural 100% cotton because of the weight and feel of it and it may be kind of goofy, but it says natural (no dyes). I’ve made enough quilts now that I am relatively sure it will survive my grandchildren tussling and still keep them warm and that’s good enough for me. I have to qualify my remarks first. I’m a guy and my hands are on the large size, so when picking out a thimble I’m only trying out large ones. So far I’ve tried out thimbles from Dritz, Clover, and Pons & Foster. I’ll give you my impression of each one. I started out using Fons & Porter brass thimble for my hand quilting and after a while was very pleased with the result. The third day of use however, left me with a green thumb… which is great for gardening, but not so nice when dealing with fabric. 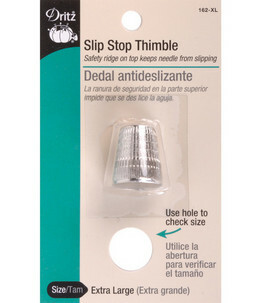 I looked around for an equivalent thimble that kept my finger its natural color and came across the Dritz thimble. 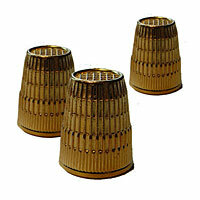 This thimble was fantastic and I did a lot of work with it on my Amish swap quilt. Alas… after so much use it was cutting into my cuticle on the back side. I’m not sure if this was due to bad technique, sizing of the thimble, or combination of both. There was enough pain though to prompt my searching for another. Enter the Clover thimble, soft supple leather and a steel coin to protect the finger. This is the MOST comfortable thimble that I’ve used and still use when I want to give my finger a break from the Drizt, but it had a couple of disadvantages for me. The coin is located on the front of the finger and when I’m using the rocking motion for quilting, I can get more stitches per inch if it’s on the top of my finger. The other issue is that at times the needle head will get wedged between the leather and the coin. That can be real annoying when you are on a roll. The last thimble I’ve purchased seamed like a good idea, it just didn’t work for me though. The top is solid and the body is elastic. It stays glued to my finger without any issue and protect it as well… but without the stiffness of the solid thimble I, once again, had trouble with not enough stitches at a time. So for now i use a combination of the two thimbles, the dritz with its solid performance until my finger hurts, then the soft leather clover to ease the pain. That is all I have to say on the subjects of batting and thimbles. I would LOVE to hear everybody’s preferences and opinions. I wouldn’t mind if it had more loft, but love to still use my quilts in the summer as well… just thinking about it make me want to be home in bed still.